Our main subject this week, as the Alaska trade prepares for its first sailings later this month, is the ongoing contest between Vancouver and Seattle. Since coming out of nowhere almost fifteen years ago to capture more than half the Alaska cruise trade in just a few years, an equilibrium seems to have been arrived at whereby Vancouver will see almost 40% more sailings than Seattle but the average passenger turnaround per ship on Seattle sailings will be more than a third higher than Vancouver’s. Elsewhere, the news has finally broken that after her 2015 season in the UK, Explorer of the Seas will be joining Voyager of the Seas to become one of Australia’s two mega liners during the southern hemisphere cruising season. And as the Bermuda season opens, it forecasts 356,000 cruisers this year, a rise of 21,000. The Port of Vancouver has been regaining on the Port of Seattle, which in recent years has taken a good chunk of Vancouver’s traditional Alaska cruise business. The worst year by far for Vancouver was 2010, when Seattle overtook the Canadian port as the busiest cruise port in the Pacific Northwest. In that year, sailings from Vancouver dropped 31% and passenger volumes 36%. Things have started to change, however, as last year, with the return of the 1,750-berth Disney Wonder, 2,002-berth Norwegian Sun, 684-berth Regatta and 1,380-berth Amsterdam, Vancouver saw a 20% gain in cruise passengers. Where Seattle was once in the lead, both ports now see about 800-825,000 passengers a year at present. After a few years, people seem to have settled on a few truths about the two ports. For one thing, ships sailing from Vancouver are 125 nautical miles closer to Alaska to start with, and they sail the Inside Passage between Vancouver Island and the mainland. Seattle-based ships, on the other hand, must take the ocean passage outside Vancouver Island in order to make up time in getting to Alaska. This route is far less scenic and amounts to two and a half days of open seas as opposed to the constant scenery on both sides experienced on Vancouver-based ships making their way north. On top of this, it can be choppy on the outside route. There is also a difference in air fares for US passengers. For most, air fares to Vancouver are often double what they can get on domestic flights to Seattle. But this concern is easily handled as there are plenty of inexpensive coach transfer services between Seattle and Vancouver (a distance of 150 miles), as well as a choice of rail journeys between the two cities ranging from Amtrak service to this year’s arrival of the Rocky Mountaineer. Last year, twenty-nine vessels sailed under Vancouver’s scenic Lion’s Gate Bridge, carrying more than 813,000 passengers on 230 sailings. These numbers compare to 177 departures in 2010, 199 in 2011 and 191 in 2012. The 2014 total is projected to be 248 departures from Vancouver, compared to 178 from Seattle. Passenger numbers are up too. In 2010, only 578,000 cruise passengers sailed through Vancouver, compared to last year’s 813,000, a rise of more than 40% in three years. At its peak, before Seattle opened up to cruise ships, Vancouver saw 340 ships taking more than 1.125 million passengers, but it may be some time before this sort of number is achieved again, if ever. Seattle, meanwhile, has grown from no cruise ship visits in 1999 to 100 in 2002 and 223 in 2009, but will drop back to 178 this year as lines such as Disney have returned to Vancouver. And because Victoria is used as a foreign port of call by Seattle-based ships to avoid falling under US coasting regulations, that port has seen a growth similar to Seattle’s, from 34 calls in 1999, 110 in 2002 and 210 in 2013. Between 2001 and 2013, Victoria experienced a 290% increase in passenger volume, to 464,000 passengers. The economic impact is sharply reduced however because 80% of cruise ship calls in Victoria fall between 6 pm and Midnight on the last night of the cruise before returning to Seattle. Further north, Anchorage saw no cruise ships in 2013 but Holland America’s Amsterdam will make four calls there from May to August this year. Ships have continued to call at nearby Whittier and Seward however. And this summer, Air Canada’s new low-cost airline Rouge will begin flying between Vancouver and Anchorage. The new link will be very handy as because of US coasting laws all one-way traffic at the Anchorage ports must sail to or from Vancouver and not Seattle, as voyages between two US ports are reserved for US-flag ships. 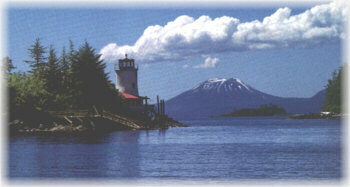 This also means that Vancouver is the only homeport offering both one-way and round-trip cruises to and from Alaska. The busiest month for the Alaska cruise trade will be August, with 51 departures from Vancouver and 41 from Seattle, with the Vancouver season running seven months from April through October and that from Seattle running five months from May through September. 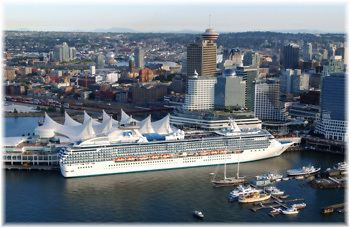 Vancouver will host thirteen cruise lines this year compared to Seattle with seven. All seven lines departing from Seattle will also depart from Vancouver. These seven lines are mostly mass to premium carriers: Carnival Cruise Lines, Celebrity Cruises, Holland America Line, Norwegian Cruise Line, Oceania Cruises, Princess Cruises and Royal Caribbean International. On the other hand, the half dozen lines that are exclusive to Vancouver are mostly upmarket or niche: Disney Cruise Line, Hapag-Lloyd Cruises, Noble Caledonia, Germany’s Phoenix, Regent Seven Seas and Silversea. By comparison, therefore, the average passenger turnaround per ship at Seattle is about 35% higher than at Vancouver, with about 3,300 passengers on and off at Vancouver and more than 4,500 at Seattle. The two largest (and longest-standing) cruise lines serving Alaska from both ports are Holland America Line and Princess Cruises, whose management has reported to Holland America in Seattle since late last year. 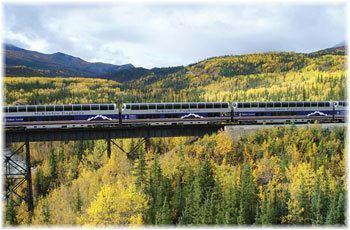 This was perhaps a natural culmination as the two lines began combining their Alaska motor coach, rail, hotel and tour operations back in 2008. Each line will send seven ships to Alaska this summer and there will also be sailings by sister line Carnival. Holland America will feature seven ships sailing 7- and 14-day itineraries. It is shifting the 1,916-berth Oosterdam to the Gulf of Alaska itinerary between Vancouver and Seward, alongside the 1,260-berth Statendam, which will increase capacity on this route. Also new for 2014, the Amsterdam will sail 7- and 14-day cruises featuring both Hubbard Glacier and Tracy Arm Fjord. Starting next month, Oosterdam and Statendam will begin their 7-day Gulf of Alaska itineraries from Vancouver. Five Holland America ships will sail roundtrip from Vancouver on 7-day Inside Passage voyages. In addition to three Sunday departures offered by Oosterdam and Statendam, the 1,432-berth Volendam will sail on Wednesdays, the 1,432-berth Zaandam on Fridays and the 1,916-berth Zuiderdam on Saturday, with about 20 sailings each between this month and September. Meanwhile, the 1,916-berth Westerdam will offer 7-night round trips from Seattle on Saturdays and the Amsterdam on Sundays. Princess Cruises will also operate seven ships to Alaska, offering four itinerary options from May to September. Departures include the 3,114-berth Crown Princess and the 1,974-berth sisters Island Princess and Coral Princess sailing 7-day cruises between Vancouver and Whittier through the Gulf of Alaska, the 688-berth Pacific Princess sailing 7-day round trip cruises from Vancouver to the Inside Passage, sailing on Tuesdays, and the 2,624-berth Golden Princess and 2,600-berth Grand Princess sailing 7-day round trips from Seattle. 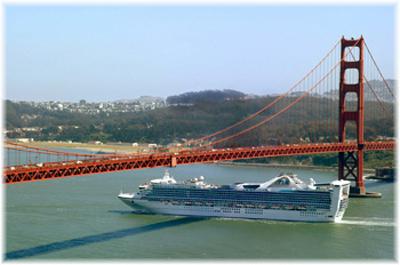 The 2,602-berth Star Princess will also offer 11-day round trip cruises from San Francisco. The Pacific Princess cruises will be the first Princess round-trips from Vancouver for some time. 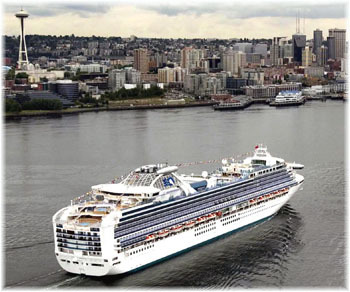 New from Vancouver in 2014, the Grand Princess will offer a 10-day California coastal voyage that departs Vancouver on September 22 for San Francisco (for an overnight stay), Santa Barbara, Catalina Island and Long Beach before returning to Vancouver. Also new in 2014 will be a 15-day voyage to Hawaii, departing round trip from Vancouver on October 2 (and again on April 6, 2015). The Cruise Lines International Association Alaska (formerly the Alaska Cruise Association) has said it expects 972,000 cruise visitors to Alaska this year, a slight decrease from 999,600 in 2013. While the final 2013 tally did not quite reach 1 million cruisers, it was the first year since 2009 that the benchmark was approached since the global recession and a now-repealed state passenger tax increase hit the industry hard. 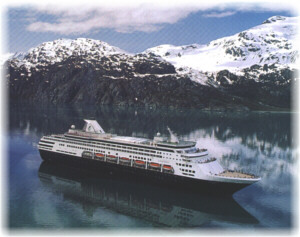 Fewer than 900,000 passengers saw Alaska by cruise ship in 2010 and 2011. About half of Alaska’s visitors arrive by cruise ship while the other half fly in or arrive by ferry from Canada or the US. Alaska saw about 5% of world cruise fleet capacity deployed to that state last year, compared to 37% to the Caribbean, 20% to the Mediterranean and 10% to elsewhere in Europe. Earlier this year, Royal Caribbean International revealed that in the summer 2015 its second “Quantum” class ship, the 4,180-berth Anthem of the Seas, would be based in the UK. 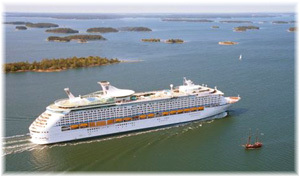 Sailing from Southampton, the Anthem of the Seas will offer twenty Mediterranean sailings starting on April 22, 2015, before heading to Fort Lauderdale in the autumn of 2015. And then late last month, the line announced that it would be sending its 3,114-berth Explorer of the Seas to Europe for the first time in the summer of 2015, to be based in Southampton. Explorer will offer 3- to 16-night, roundtrip itineraries from late April through September 2015. Prior to Explorer of the Seas’ arrival in Southampton, she will undergo a ship-wide revitalization, adding a FlowRider surf simulator, 3-D movie theater, new specialty restaurants and new staterooms and suites, including virtual balcony staterooms. Now, in its latest release last week, Royal Caribbean revealed that the Explorer of the Seas will be heading Down Under at the end of 2015, with an October cruise to Singapore and then further cruises that will put her into Sydney for the first time on November 28. At the same time, the 2,146-berth Radiance of the Seas will leave Vancouver at the end of her 2015 Alaska season to act as Royal Caribbean International’s third ship in Australia. This year marked the second time that Royal Caribbean had a large ship in Australia with the Voyager of the Seas, which first arrived in Sydney in November 2012. Although the two are sister ships, the Explorer’s 137.308 tons so very slightly exceeds the Voyager’s 137,280 that Royal Caribbean have been making a big deal about the Explorer becoming Australia’s largest cruise ship when she arrives in 2015. Cruising in Australia has seen extraordinary growth in recent years, with close to 700,000 trips taken by Australians in the 2012-13 season. 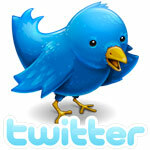 If current growth continues, this figure is expected to hit 1 million within three or four years. Bermuda expects to see 21,000 more cruise ship visitors in 2014 than in 2013, for a total of 356,000, more than a 6% increase and appreciably more than the number who arrive by air. In 2014, there will be 104 regular callers and 27 occasional calls to Bermuda, including the 2,974-berth Carnival Splendor and 2,000-berth Vision of the Seas. The first arrival of 2014 was the 148-berth Wind Star, which docked at St George’s on April 5. 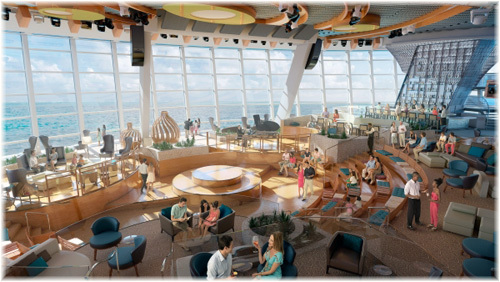 The 4,000-berth Norwegian Breakaway will make twenty-two visits in 2014. In 2013 this ship alone brought 90,000 visitors to Bermuda. Also returning are the 2,476-berth Norwegian Dawn, with twenty-two trips from Boston, Royal Caribbean’s 3,114-berth Explorer of the Seas, with twenty-seven calls from Bayonne NJ, the 1,950-berth Grandeur of the Seas, with fourteen cruises from Baltimore, and Celebrity Cruises 1,950-berth Celebrity Summit, with nineteen inbound calls from Bayonne. There will also be three cruise calls from Charleston by Royal Caribbean’s 2,000-berth Vision of the Seas. Only the smaller, premium cruise ships can dock in the City of Hamilton or the Town of St George’s. 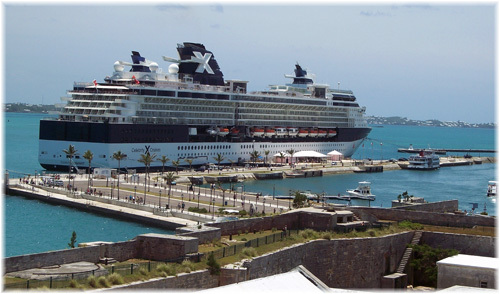 Larger ships are limited to either serving the above two ports by tender or docking at one of the cruise ship berths at the Naval Dockyard, which is served by ferry from Hamilton. Contract lines, subsidized by Bermuda for weekly service, include Norwegian Cruise Line, Royal Caribbean International and Celebrity Cruises. Other ships will be arriving from Aida Cruises, Azamara Club Cruises, Crystal Cruises, Cunard Line, Holland America Line, Oceania Cruises, P&O Cruises, Princess Cruises, Regent Seven Seas, Seabourn, Silversea and Windstar. Holland America, which had been operating the last regular New York to Hamilton service until it withdrew at the end of 2012, will return with a new Boston to Hamilton service in 2015.